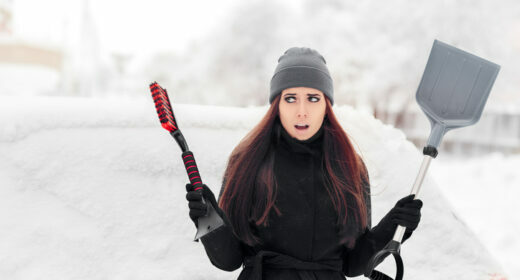 Snow dilemma – should I clear my drive? The Beast from the East is taking its toll and as a result driveways and paths up and down the country are covered in snow and ice. So, should you do the sensible thing and clear them? Or do you risk getting sued if you do? There’s a myth that crops up every time snow hits the UK – that doing the neighbourly thing and clearing the pavement outside your house could land you in hot water if someone passing by was to fall. However, the Department of Transport has made it clear that people walking on snow and ice have a responsibility to be careful themselves so don’t be put off from taking action – so long as you’re not doing anything to make it worse! Here are our top tips for keeping that driveway clear. It may sound obvious but DON’T USE WATER to melt the snow. With temperatures dipping below -10 degrees in some areas of the country chances are the water will refreeze and turn to black ice. Salt or sand should be used to clear the area. Table salt or dishwasher salt will work well – a tablespoon for each square metre you clear should work. Be careful not to spread salt on plants or grass as it may damage them. Use more salt on steps as these can be particularly dangerous. Do it as early in the day as possible. Fresh snow is easier to move. Consider where you’re moving the snow to. It shouldn’t block drains. Meanwhile, if you block other people’s paths in order to clear yours you’re unlikely to win any friends!